Covering an election cycle is one of the most impactful and complex projects The Post undertakes. 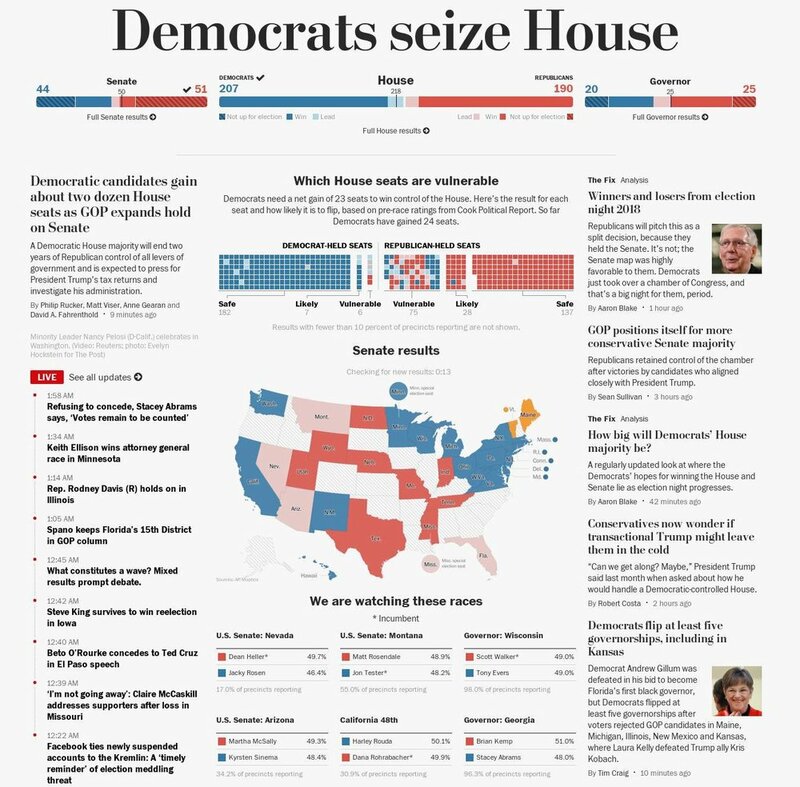 Our goals in 2018 were ambitious: to best present The Post’s incisive reporting throughout the months-long primary cycle, to evolve our suite of election infographics, and to use innovative techniques to tell the story of election night. I led the digital election effort within the newsroom. As part of that work, our graphics team created new visualizations to track broad changes in the balance of power in Congress and granular shifts in political opinions in congressional districts. Our engineering team refined the custom election infrastructure that served real-time data at the county and state levels during primary and general election races. I co-created the Election Ticker, a live feed of results and analysis powered by artificial intelligence, with editing by humans. The ticker ran on The Post’s home page, election-results pages, and politics article pages throughout election night. Our artificial-intelligence platform, Heliodeck, created individual pages for each race for governor and Congress. We also wanted to tell the story of the election from a creative angle. I worked with The Lily, The Post’s publication for millennial women, to track the record number of women running for political office by hiring an artist who painted a mural of an eagle on a wall at a D.C. hotel called The Line, with each feather representing a woman candidate. As the results came in, she filled in the feathers for women who won. We featured the story on Instagram and on The Post’s live election broadcast, and the mural is still available for selfies at The Line. Most news organizations understand that engaging with readers is good for us — it enhances our journalism, strengthens loyalty, and unlocks data critical to understanding our audience. But engaging takes time, and separating the signal of genuine interaction from the noise of spam and insults is one of the biggest challenges in digital journalism today. The Coral Project addresses that challenge head-on. Coral began as an unprecedented collaboration between The Post, The New York Times, and Mozilla to create open-source tools to help any newsroom engage with readers. With my co-founders, I drew up Coral's initial set of goals, hired its staff, and secured an initial $3.89 million grant from the Knight Foundation to fund its work. Our team created two platforms: Talk, a comment system with a companion moderation portal, and Ask, a tool that helps newsrooms create engagement forms and galleries of reader responses. We also created a set of guides to engagement strategy and practices. Coral's tools have been used by dozens of newsrooms, including The Post, The Wall Street Journal, Univision, The Boston Globe, and The Miami Herald. An article alone isn't always enough to make a story hit home — or to satisfy a curious reader. That's why I co-created a cross-departmental team at The Post to build tools to help our journalists tell stories in unusual, engaging ways. Our Story Tools team now has more than a dozen apps under its belt, allowing anyone in the newsroom to build four types of quizzes, charts, interactive maps, polls, brackets, ballots, submission forms, bingo boards, and reusable notes that can add background information to Post articles. Story Tools applications are also available to customers on The Post's Arc Publishing suite. The Washington Post gets more than a million comments a month. Many are illuminating; some are just insulting. Picking one from the other has been a painstaking task, but technology is making that work more efficient. 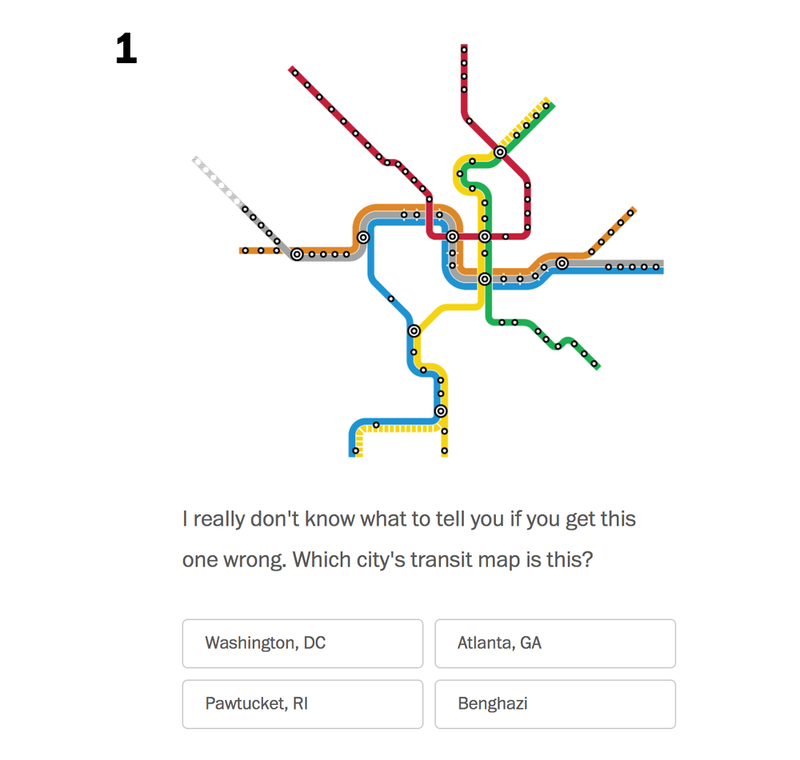 I worked with The Post's Big Data and engagement teams to conceive of and create ModBot, a tool that uses an algorithm trained by data from human moderators to rank user submissions at lightning speed. ModBot isn't meant to replace human moderators — engaging with readers is most effective when it's a two-way street. But using it has meant that Post moderators can spend more time highlighting good comments and less time removing bad ones. Readers could discover news based on their interests using Trove, which analyzed the text of many thousands of articles and filed them into topic-based channels. It was a serendipity engine. Social Reader delivered news on Facebook from more than 100 publishers based on the interests of the reader and their friends. I ran the news team for Social Reader and Trove as managing editor of WaPo Labs. Navigating the D.C. Metrorail system is made a bit simpler with this iPhone and Android app, which lists train times and transit-related news.